For the month of November, this post will form a writer’s notebook, allowing the reporting of wordcount and other efforts through the writing marathon of NaNoWriMo. There’s one over on the sidebar also. But here’s a calendar based one. 28th November. 84K, wait 81! After a mammoth sprint to complete off the final act this morning, I finally decided to call it, and claim the winner’s title. But hey, done is done. We are done, as Red Foo’s song goes. I’ve been humming hahhing hiccuping over whether or not I should just calibrate the darn thing and claim the winner badge – each and every day of this week. Technically 75K was my real target. I still have several scenes to write before the first draft is finished however. Another 20K should do it. Then I took a look at the NaNo website and overachievers forums, only to read that many of those guys on there have 100K. There’s a lady with 444444 (the new devil’s number, I tell you!). Holy pantsman, that woman mustn’t have any fingers left. But each to their own pleasure I guess. Freebie Tip to anyone out there: Don’t read other people’s word count. So I guess I’ll write on for another coupla days. Having this kind of incentive, to simply sit down and write at a repetitive time, has worked out for me this month. Having not spent enough time on rough planning, that hasn’t. 17th November – 54K words. Won already. There is a post title on one of the forums on the NaNoWriMo website titled: “The I’m Going to Overachieve Despite the Fact that I Barely Have Enough Time to Participate At All Thread”. I may have got wordcount and won already, but I’m only approximately halfway through my story, which is a meandering mess of pointless scenes and loss of marbles plot. So, basically, on a level where it actually counts a lot – I’m only half way there, and there’s double the time of editing needed to rework and get to any workable stuff. OMG or oh my gosh as my daughter might say. Secondly, Over achievement is the norm for me personally, and I know how annoying that is. But over achievement should be something we can at least celebrate, and instead you get the general cultural gist that we should shush up about it, and pull our heads in. After just passing the winning zone on Saturday morning I felt worn out, hardly celebratory at all. The day before I’d gone through my third root canal in as many weeks, with more coming up in this third NaNo week. I’d struggled to make daily word targets most of the week–which is pretty much par for course for WriMo overachievers – we tend to start off with a blast through Week 1, knowing that we will later encounter days where it gets tougher, with more external and internal obstacles to our writing. And thus, this happened to me too. So after supposedly “winning”, I gave myself Sunday off,. And I made teacher end of year gifts, a craft that was running out of time to be done in, given it’s only two weeks to year end. We overachievers, like WriMo norm-achievers and underachievers alike, all know how to put off other less “important” work– until such time as it suddenly becomes relabeled as overly important that is. Have I moaned already that for WriMos living down under, November is the worst possible month to attempt a writing marathon within? Yes, I no doubt have. Week 3 is reknowned for being the toughest week of NaNo, as the muse goes wandering. It’s when a lot of WriMo’s give up. And I do not lie, I have another large root canal to get through, more softball-focussed weekends, and in the last week – several end of year / school graduation events to attend for my daughter. And the root canal. Did I mention the root canal? (Which is one of the most difficult things to explain to both my twelve year old, and hair dressor – you try it, try explaining what a root canal actually is, and does. Even if you’re a dentist). 7th November – 30K words / heck, I’m so brain-addled I have no idea of what percentage that is of the flaming target. I have taken my puppy dog a thousand times (no, literally) out to do his toileting business (and missed the queue more times than necessary). I have had another root canal with more to come. I have chauffeured family members to and fro school / work or music exams. I have made two gingerbread houses as a school activity. I have made softball umpiring arrangements. I have spent hours creating a comic strip about coffee. And I have written 15 scenes of mind-numbing krapola that has brought me to tears of guilt, ineptitude, self-commiseration, near-giveupedness, sheer terror, living nightmares and other writing expletives not printable. 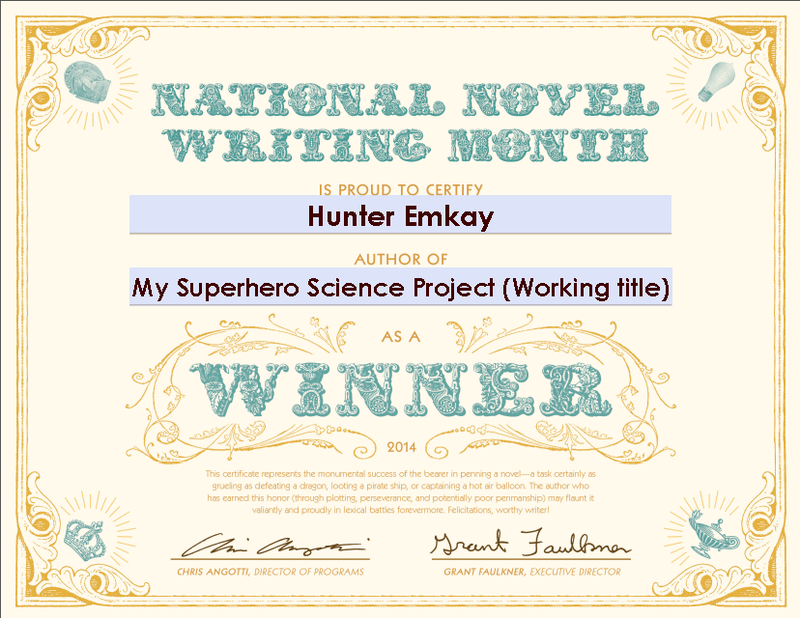 Such is NaNoWriMo, my first week of it at least. Roll on next week, which I believe is meant to be the week of torture. I’ve got coffee back in the house at least. Now for the M&M’s. Six hours writing / 2 large scenes (should be split out later) / 5500 words today. I actually wrote on Saturday and Sunday early mornings this week. Between family activities. The writing sessions felt like a burden, but provided valuable writing. Normally I sit and write in flow for hours on end. This time around Dougie the puppy’s toileting routines enforce I take many breaks away from the desk – which is teaching me how to best get back into flow when I return. The enforced breaks, although much healthier for me, also mean that my head is not as much focused on living the story every waking hour (and sleeping ones also). I’m therefore not as passionate or motivated as I would like to be. This lack of story-addiction means my head is opened to too many worries and thoughts over other issues. Which can be distracting. NaNo this year is the worst timing for me, ever! There are almost daily evening or school activities, concerts, film festivals and the like to rehearse and attend, as my daughter enters her final month and graduates from her junior school. And then there’s the temperatures – writing on Saturday through 37 degree Celsius heat was not my most magnificent writing-snapshot. Thankfully there are no photos to share. No, thank-you. There’s a big debate on many blogs over editing or not whilst writing through NaNo. I used to be on the “definitely no editing!” side. But this year I’m consistently reading back and editing for better word choices through the scene I’m currently writing. There is good and bad for this approach as I’ve discovered. Similarly, I used to be a consecutive writer – I started with the very first opening scene, and moved on one by one to the end. I also used to be a big plotter, but that’s changed over the last couple of years, and I entered NaNo this year with a very bare outline, if you could call it that at all. But also this time around, where I know of specific scenes needed, I’m writing them out of order. Today I wrote the first sub-plot scene early on in Act 2, then jumped back to a mid-scene – the inciting incident – from Act 1. A lot of this seems foreign to my normal writing processes. Still, I write on.